We stopped in Duluth overnight after our ski trip and intended to drive home the next morning. 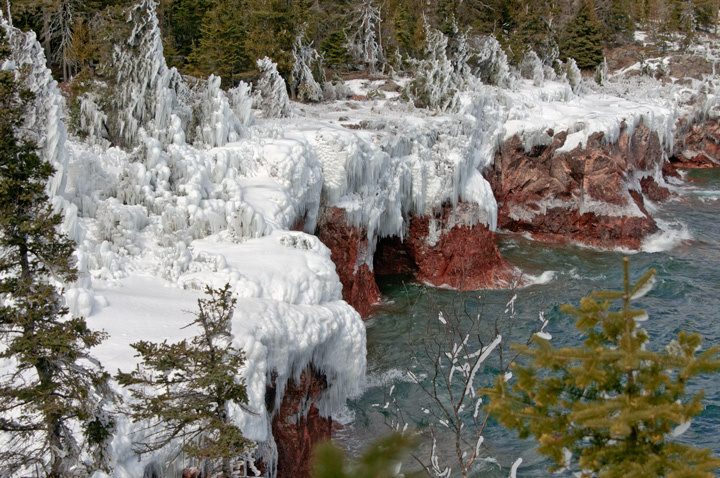 When we woke up we decided that it might be fun to drive up to Tettegouche State Park to do some hiking. The Minnesota North Shore has almost no snow so we didn’t need our snowshoes which we forgot at home. As we were getting ready to leave for the day we noticed that it was snowing quite hard. This hadn’t been in the forecast and when we looked at the radar on our phone it look like a small band of snow extended from Duluth all the way north of Tettegouche. We kept driving and reached Tettegoushe at mid morning. We decided to take the hike along the north side of the Baptism River to the High Falls. Although there wasn’t much snow we decided to use our ice cleats because the trail was icy in spots. It continued to snow off and on during our trip to the falls. Our first stop was Two Step Falls. This was not very impressive since it was iced over and covered with some snow. Our next stop was High Falls. This was very impressive with a lot of definition and color in the ice. The river was frozen so we were able to walk up to the bottom of the Falls. We noticed a couple of flags that someone had planted at the top of the falls. I forgot to ask the ranger if someone was ice climbing at the falls and planted the flags. The fresh snowfall left some nice patterns on the ice and the rocks surrounding the falls. This trip was well worth the walk. This concludes my three blog coverage of Bond falls. Winter waterfall photography often lends itself to black and white photography because of the stark colors. More photos from the trip can be found on my website. Waterfalls offer a great opportunity to take some intimate close-up photos. Folks generally feel they need to take the wide angle shots showing the full waterfall but intimate photos can also be quite spectacular. As those of you who follow this blog know, one of my favorite winter destinations is Bond Falls in Michigan’s Upper Peninsula. a couple of weeks ago my wife and I were in Ironwood, Michigan cross country skiing. The following morning we decided to drive over to Bond Falls. This was after a very cold spell. The highway department had plowed the roads but they were snow packed and slippery. It was like driving on a washboard. When we arrived at Bond Falls we knew it was going to be something special. The cold weather had created a lot of ice and there had been a fresh snowfall. We were the first visitors since the snowfall. This is a view of the steps that go from the top of the falls to the bottom. In the winter it is impossible to navigate the steps because of the ice. Fortunately we are always prepared and had our ice cleats along. As we walked along the west side of the middle branch of the Ontonagon River the views just kept getting more spectacular. We returned to the car by walking along the east side of the river. The trail is not as good on this side and the views are not as good but it was still beautiful.